Submitting an application for an internship… some do’s & don’ts…. Here at the bakery we offer an internship program. It is a very competitive program to try and get into. We take on many students from the French Culinary Institute, Culinary Institute of America, Johnson & Wales and many other accredited pastry programs. While most of the submissions I get follow our directions for the application process, I have to say some of the others need a little work. 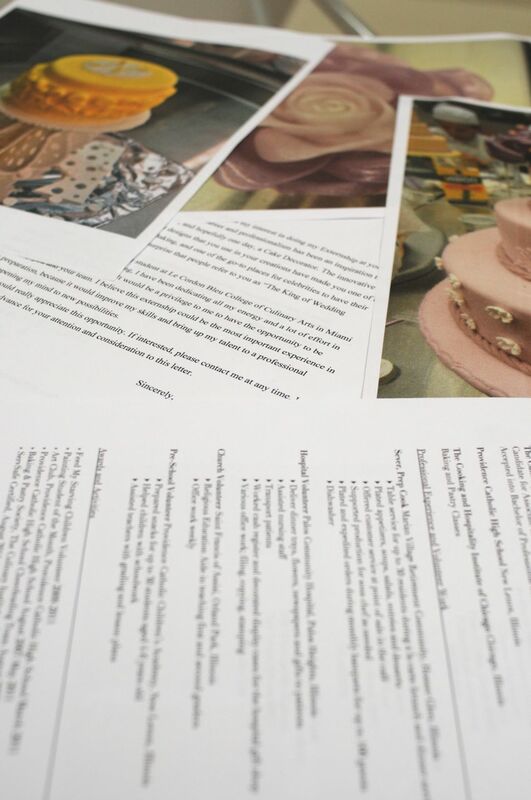 – When submitting a letter of recommendation from a pastry chef instructor, it should be on school letterhead with a signature. – Show up for your trail date on time; research your directions to the location before hand. – Show us a few examples of your best work. It does not have to be a cake, but it should be well executed and something you are proud of. – Do not send me links or Power Point presentations when I specifically have asked for a few samples of your best work. – Do not lie about your previous internships or schooling. We are a very small industry and we kind of all know each other. We do call to check out references. A well presented application is a great "first impression". It shows you paid attention to the directions and took the time to put together a thoughtful interpretation of your work with a well written cover letter, resume and photos. Before you even come into trail you are “auditioning” for the intern position. This starts with the first email that is sent. Keep in mind that a first impression is everything and that starts with your application process, not when you physically walk through the door to trail for the day. I read a lot of resumes and see a lot of photos of work. I have seen some really great things. However, had to question many applications that come across my desk because of spelling mistakes or writing as if you are texting on a mobile phone. Right off the bat this shows me you that you don’t take the extra effort to make sure you are presenting us with the best possible package, which is yourself. We produce an exemplary product at the bakery and if you want to be a part of that team, you need to show us your skills upfront. This starts with the submission of your paperwork to the bakery. You actually “trail” for the day – not trial. Doesn’t it BLOW YOUR MIND that you have to tell someone to submit a resume with no spelling mistakes and proper grammar?? Being self employed my entire adult life, I have gotten some REAL doozies!! It is, actually, amazing at the sheer amount of sloppy applications which come every day. Circular file – every last one. And the folks who show up personally looking for a job – greasy hair, dirty jeans and stinking of smoke? Um, no thanks. ← What is Ron doing today?? ?